Other than the Wagah border ceremony, the Golden Temple, and Jallianwala Bagh, there wasn’t much touristy we wanted to see in Amritsar. Beth hired a taxi for a day to go on a bird watching trip, and so I went shopping. I wanted to buy a second sweater, in particular a sweater vest. Amritsar was just too cold to get by with just a shirt, but my one sweater I brought with me from the US felt too bulky some days. Plus, since I was wearing it every day, I wanted something else I could wear on the days I needed to wash it. So I took a taxi to a shopping mall, had lunch at McDonald’s, and found a place to buy a locally made sweater vest. 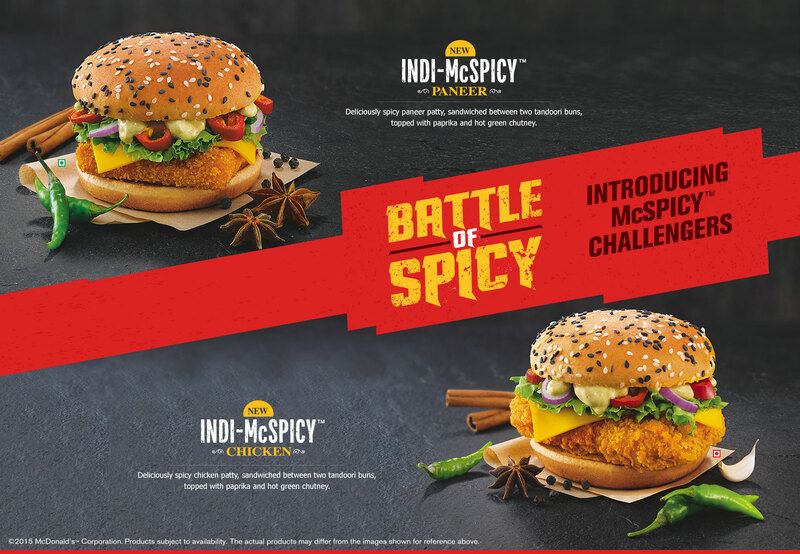 At McD’s, I had the spiciest food of my entire trip to India. They had a sandwich they were promoting called the INDI-McSpicy Chicken, offered in a combo with a Coke and fries for a reasonable price. My first clue should’ve been that the sandwich promotion is called “Battle of Spicy” but I didn’t notice that at first. However, by midway through the burger (in India, any hot sandwich is apparently called a burger, even if it’s chicken instead of beef) I was sweating. This thing has really hot red chiles on it, plus a spicy batter around the chicken, plus a chilli mayo sauce for the top. This sandwich would kill most American McDonald’s fans. There would be lawsuits, I’m sure. As it was, this was at the limit of my tolerance for spicy food, and that’s saying a lot. A day or two later, we headed out for Chandigarh. For the long stretch of road between Amritsar and Chandigarh, we decided to take a bus. The trains were all full, since we inquired on short notice. And we didn’t want to spend the money to hire a car. Two bus tickets only cost around $15, while hiring a car would be about $80. The bus didn’t leave until 2:45 in the afternoon, so I requested and got a late checkout at the hotel. Once we checked out and had lunch, we got a tuk-tuk to take us to the bus terminal. This bus was run by a private company called Libra, so there was no fancy bus terminal. Basically, they pull into a muddy lot near some construction, and that’s where you get on. The tuk-tuk driver knew where we needed to go, and we left an hour before the bus was supposed to leave, plenty of time to go five kilometers, right? Wrong. We got to a point in the journey where we had to stop for a railroad crossing. That shouldn’t be a big deal, we all thought. The train will go by and then the gates will come up and this traffic jam will clear out. Only the gates didn’t go up. We waited and waited. Beth asked if there was an alternate route to get to the bus “station”, but apparently there wasn’t. The tuk-tuk driver got out and consulted with other drivers. At one point they all decided 20 minutes was more than enough time to wait for this damned train, and so everyone started turning around. But then apparently our driver decided that for where we needed to go that wasn’t going to work. We couldn’t get around the train in the short (and dwindling) amount of time we had left. Finally, when it became clear we had to act now, the driver suggested we should get our luggage, walk under the gates blocking traffic, and then find a driver on the other side to take us the rest of the way. Beth leapt into action, pulled the bags out of the tuk-tuk, and we were off like a shot. We ducked under one gate, crossed the tracks, ducked under the other gate, and then the tuk-tuk driver spotted a bicycle rickshaw without passengers. The two rickshaw wallahs did some quick talking, the auto rickshaw (tuk-tuk) driver took 10 rupees from the bicycle rickshaw driver, and turned to us to say, “Pay this man the fare instead.” We threw our huge suitcases onto the back of the back of the rickshaw, and this guy pedaled like the devil. However, when we got to the area where we knew the bus would leave from, we had a problem. The rickshaw wallah didn’t know where the bus station was, and neither did I, though I’d seen buses in a vacant lot somewhere around here a couple days earlier. We asked around, the rickshaw puller asked around, but nobody knew anything about where the Libra bus departs from. But I finally spotted it across a big roundabout and down the street a ways. There was the big pink bus with LIBRA painted on the front. I excitedly pointed and shouted at our rickshaw man, and he pedaled as fast as he could. The problem was the road we went down had a median and so he couldn’t do a U-turn to get us up to the bus. So Beth shouted, “STOP! STOP!” And the guy stopped. I hurriedly paid him the agreed-to price, we grabbed our luggage off the back of the rickshaw, and we dove into the stream of oncoming traffic, hands out in the international “stop” gesture hoping they wouldn’t run us over. It looked like we might actually make it to the bus! We climbed aboard and settled into our reserved seats. And shortly thereafter we were underway. On our way out of town, I spotted the railroad crossing where we’d been stuck before. The crossing gates were still down as we drove by, and the traffic jam was still waiting for the train to pass by, nearly an hour later. Shortly after we were underway, they started playing a movie on the TV in the front of the bus. We were only a few rows back, so we could see it pretty well. And they played the soundtrack over the bus’ speaker system, so there’s no way anyone could ignore it. Later I’m gonna tell you a strange story about the two movies they played on that little movie screen. About 90 minutes into the bus journey, the Libra bus stopped at a rest area type place, where Beth and I both bolted off the bus and to the bathrooms. Remember, I had to pee pretty bad before I even got on the bus. At the rest stop, I peed for so long I think the people of India will tell legends about me. I walked up to the urinal with a couple other guys. We all did our business, and when they came to the natural conclusion of their bladder contents, they zipped up and walked away, to be replaced by two other guys. But I’m still peeing. The second pair of guys did their business, zipped up, and then walked away. And I’m still peeing. About this time, it didn’t hurt anymore, but I could tell I was far from done. Then a third pair of guys stepped up to replace the last guys at the urinals. The third set of guys did their business, and finally my bladder is starting to reach the end. And we all three finished about the same time. A hush fell over the restroom as I zipped up and swaggered to the hand washing station. Head held high, I nodded left and right. I’m sure the message was clear to all, despite the language barrier: Now that is how we Texans take a full size piss. Sorry I didn’t think to buy one extra and mail it to you. I can only imagine what it would look and taste like after several weeks in international post. Plus, it would cost 80 bucks or so for shipping, most likely. I guess you’ll just have to come to India and try it for yourself.